Recently, I was looking for my 6x great-grandmother Barbe Cartier’s burial record. When I did a Google search for other details about her life, I came across Justin Trudeau and his family tree. I noticed the surnames Lalonde and Bray in his ancestry and decided to see if they tied in with my ancestors by those names. They did. 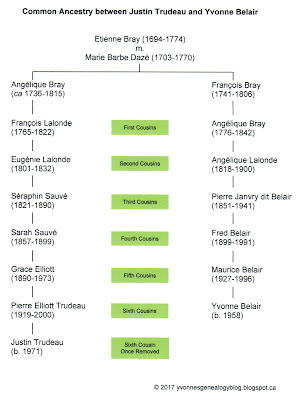 Here is a tree showing how Justin Trudeau, the 23rd and current Prime Minister of Canada, is my sixth cousin once removed through our common ancestor Marie Barbe Dazé, younger daughter of Barbe Cartier (1678-1705). Copyright © 2017, Yvonne Demoskoff. Wow! Yvonne, this is such fun! It sure is! Marian. One bonus of finding famous relatives is that their trees are often done and it makes it easier to find one's own distant ancestors.